When I was 11 or 12, I received a cookbook as a gift from a family friend. The book was for some fundraiser I can't remember, but I do remember that the entire book was filled with cookie recipes. 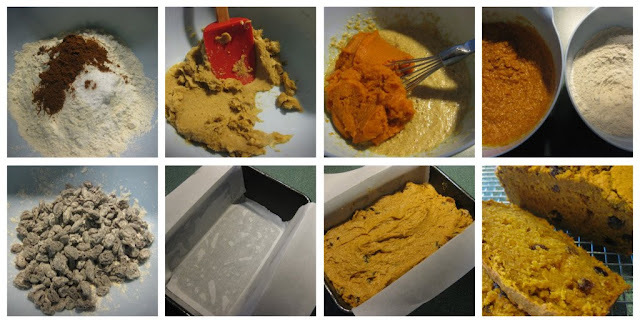 One recipe that I loved was a pumpkin raisin cookie called Pummies. They were soft and moist and bread-like. I still have that battered cookbook and for some reason I just couldn't stop thinking about those cookies this fall. I figured I'd try to make my own version of pumpkin bread inspired by my old school favorite recipe. This bread is dense and moist and the recipe makes a heavy loaf. It's not overwhelmingly sweet. This is a pumpkin bread, not a cake, after all. I don't care for nuts in my breads, so I opted for raisins. I guess you could add nuts or omit raisins if you wanted to, but I love it just the way it is. One bite of this bread reminds me of October and November. It has a subtle hint of sweet spice and it's great warm or at room temperature. I especially love this recipe because I can mix it by hand (no electric mixer or Kitchen Aid to clean). Preheat oven to 350 degrees. Spray a 9x5 inch loaf pan with nonstick spray and line with parchment paper. In a large bowl bowl, whisk together flour, salt, baking powder, cinnamon, and nutmeg. Set aside. In a medium bowl, cream together butter and brown sugar until well mixed. Stir in eggs and pumpkin puree until well mixed. Make a well in the dry ingredients (flour mixture) and stir in the wet ingredients (pumpkin mixture). Do not overmix. Gently stir in raisins and pour into prepared loaf pan (batter will be thick). Wrap pan on the counter a few times to even out the mixture. Bake at 350 degrees for 60 to 75 minutes. Bread is done when a toothpick inserted in the center comes out clean. Remove bread from pan immediately after baking and place on a cooling rack. It looks like its sturdy enough to use as french toast. Mmmmmm, the wheels are turning! Thanks for sharing. Mmmm... I love raisins! I know some people don't care for them, but you could use nuts or even cranberries. I've made similar recipes with fresh cranberries.